This is me in 2006 just before I moved to Findhorn. 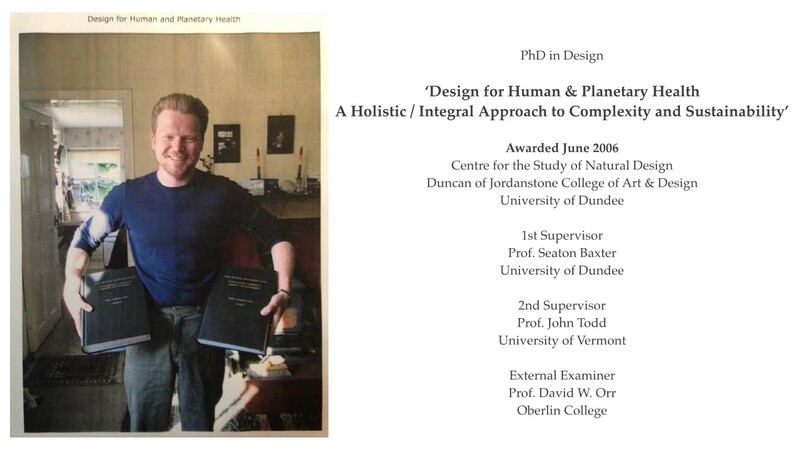 The two large books I am holding in my hand are volume one and volume two of my PhD thesis: ‘Design for Human and Planetary Health: A Holistic / Integral Approach to Complexity and Sustainability’. Sounds very academic!? What is amazing [to me today] about this, is when I finished the PhD I could not find any post-doctoral research grants, nobody wanted to fund me because my work was too trans-disciplinary. I was sent from one funding council to the other. So I kind of put my PhD in a drawer and came to Findhorn. … In those days it was good to hide your PhD. There was a bit of an attitude, that if you had a PhD you were in your head so you could not be in your heart and you probably weren’t spiritual. […] I don’t think it is like that! Just recently, this summer, I had a phone call from Anthony Capon — a professor at the University of Sydney — who said he was going to be in Europe and between two conferences he had some time and would love to come and see me on Mallorca to talk about my work. I said, yes, sounds interesting, let’s meet. He is a co-author of a report that came out in 2017 by the Rockefeller Foundation and The Lancet — the top medical journal — that is called ‘Planetary Health’. This whole meme of ‘planetary health’ has grown enormously over the last years — and I was not actually aware of that until I saw the report had been published. 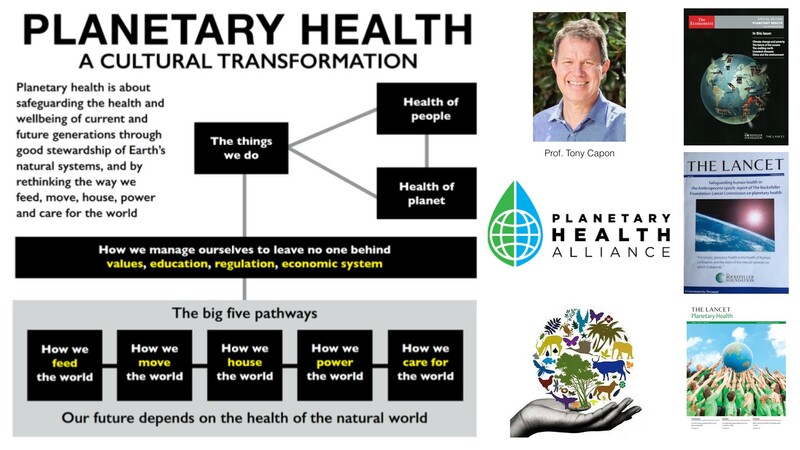 There is a whole field of medicine now that understands that there is a deep link between ecosystems health and ‘planetary health’. Health actually is — and this comes from my PhD — an emergent property of complex dynamic systems at different levels of scale. So a healthy cell sits in a healthy organ in a health body in a healthy family in a healthy community in a healthy bioregion in a healthy ecosystem on a healthy planet. And of course it goes the other way around. If we do anything that is unhealthy at any of those levels it affects health at all the other levels. 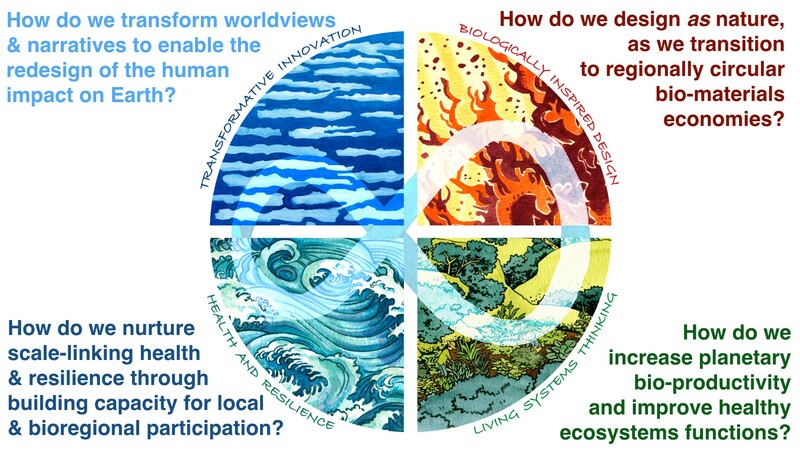 I came to work on planetary health using a different name [under the framework of regeneration]. 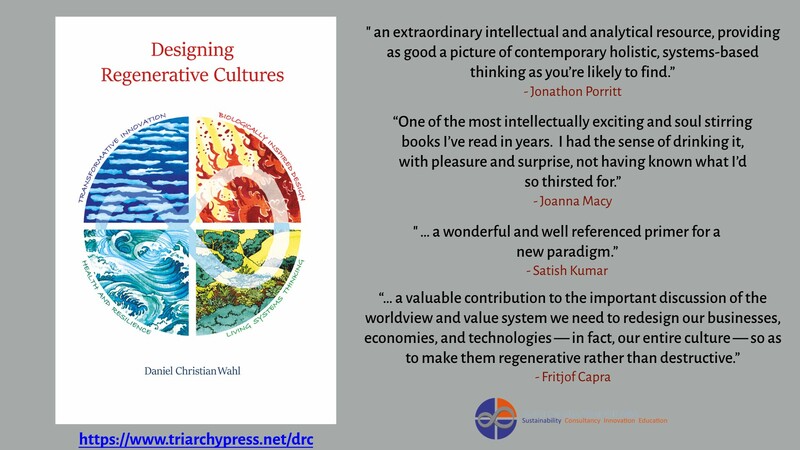 A couple of years ago I published a book called ‘Designing Regenerative Cultures’ because the idea of regeneration is also about health. Resilience is also about health. The title of my book harbours a — somewhat — paradox. On the one hand we need to redesign the human presence on Earth, and on the other hand cultures aren’t designed, cultures emerge out of the interactions that we have with each other — through the stories we tell. I have learned from one of my mentors at Schumacher College that “if you step on a paradox, you can be sure to have some truth on you shoes”. Life is much more complex than linear either/or thinking. So when we work with paradoxes we get closer to what truth is actually about. In writing this book — very early on I realize, asking myself ‘what can I write in this book that would actually be meaningful in ten, fifteen years, twenty years time’ — I realized that most of the solutions that human beings have created for themselves and for future generations were created with the best of intentions. Nevertheless, so many of them have turned into today’s problems. So yesterday’s solutions turn into today’s problems. 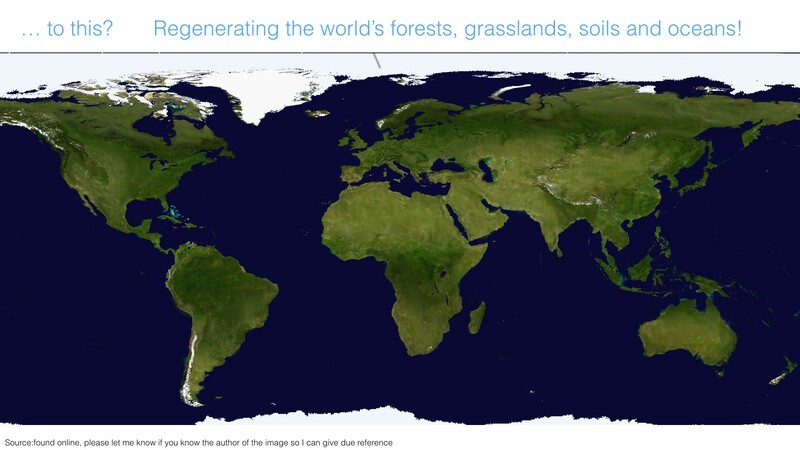 Who are we to thing that our sustainable, regenerative, green — or what ever you want to call them — solutions will not turn into problems later on? Maybe we have got it wrong as a culture? Questions aren’t transient means to get to better answers. 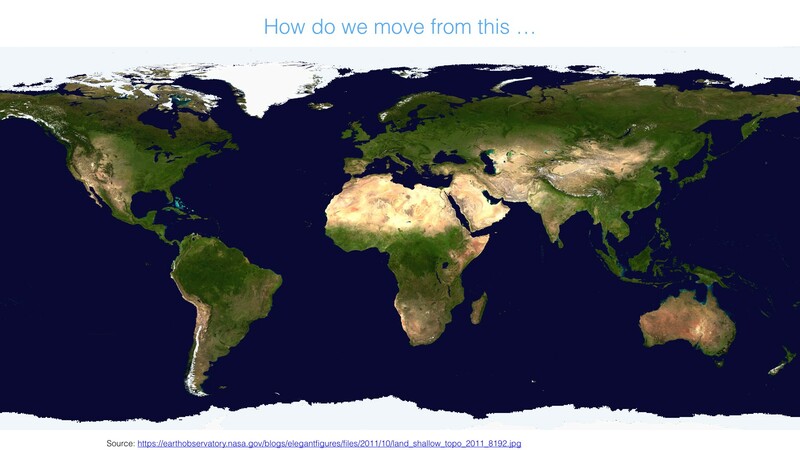 Maybe answers and solutions are transient means to help us ask better questions? Maybe a wise culture — when you try to create a compass that you can hand from one generation to the next — would actually create a set of questions to give to the next generation? How to we fit in? Who are we obliged to? Why are we here? Where are we going? What is this all about? These questions need to find new ways of making meaning. My mentor David Orr once floored me with a question, saying “Daniel before we can find the answers to the questions of the how and the what we might have to do in order to create a sustainable human presence on Earth, we have to ask ourselves a much deeper question. And that questions is: What is it about Humanity that is worth sustaining?” — And if we find an answer to that question then we might learn to live into the future in a wiser way. 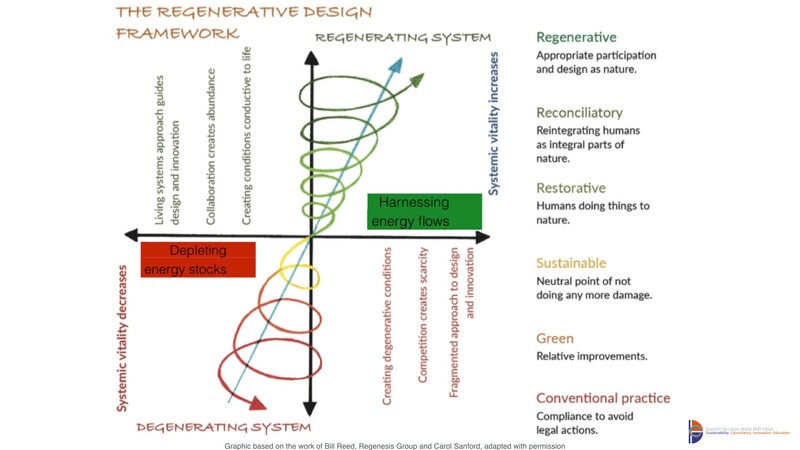 Very briefly, what do I mean by regenerative? This spectrum [below] is from a friend of mine, called Bill Reed, who works with a group called the Regenesis Group. It has also been influenced by a woman called Carol Sanford. Basically, there is a spectrum from ‘business as usual’ to ‘green’, which means doing things a little bit better, polluting a little less, using a little more renewable energy — which is part of the journey. Then we get to ‘sustainable’ which means no negative impact, not adding any more damage. But because we have done so much damage we need to do more than that. So then you move into restorative, which can still be practiced in a mindset that views humanity as having power over nature — perpetuating the separation between man and nature. I am saying ‘man’ on purpose, because they have created most of the mess. This can lead to efforts like, for example, a large scale reforestation with eucalyptus in an already water-stressed area. They look very nice for 10 years or so and then they all die, because we ‘engineered’ an ecosystem. So once we do the reconciliatory step and shift the organizing idea to that we are actually nature — that we can design as nature because we are nothing but it: biological beings first and foremost — then we move into working regeneratively. The oldest written story of humanity is the Epic of Gilgamesh. 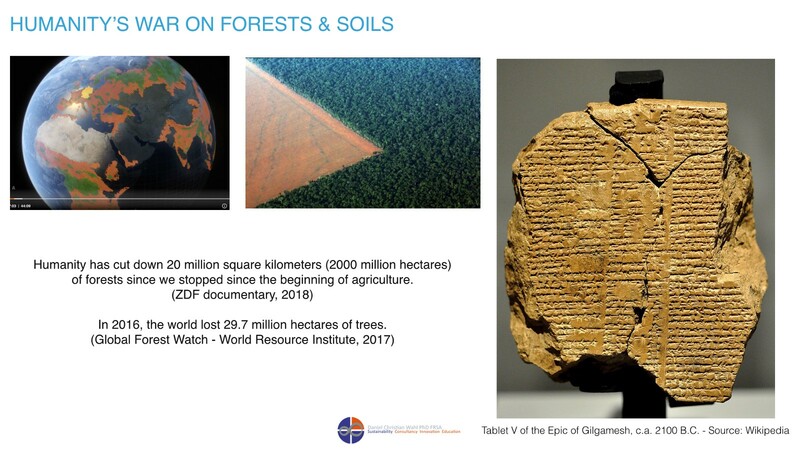 It tells the story how Gilgamesh was told by Humbaba, the forest good, that he was the all-powerful king but he was not allowed to cut down the Cedars of Lebanon. What did he do — the arrogant ______, I won’t say the word — he ordered himself a Cedar-palace, killed Humbaba and cut down the forest. A modern ecologist would call this downwind desertification: Humbaba’s curse was that if you cut down the forest, your rivers will run dry, your soil will go salty and your empire will crumble. That’s precisely what happened [with the once fertile garden of Eden of the so-called ‘Fertile Crescent’]. So we need to go from this.